How to make money with 3D models? First of all, I want to tell you my own impression of one store which I liked, it's 3DExport. 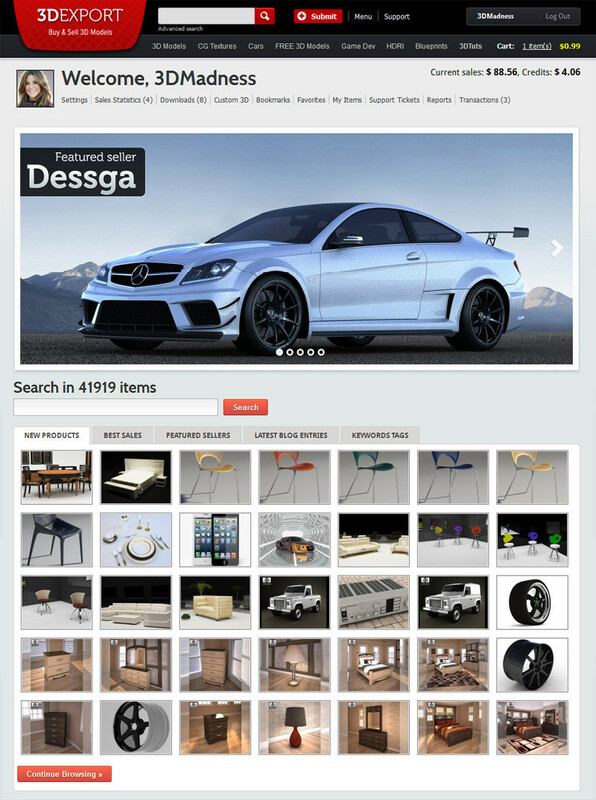 The store has more than 40 000 3d models, that in its turn not. Of course, I haven’t looked through all 40 000 models, though taking a look at the main categories of different genres, I can say that most of them are really of a high quality. I like this way of content selection– it’s easy for buyer to search for the model, he needs, instead of looking through the bunch of junk, like I do it on TurboSquid. The store holds out different contests, giving discount coupons and gift credits that really allows to get good value for my money as well as save up. What is extremely pleasant is that they have Customer Loyalty program (up to 10 % OFF). One more bonus – when you purchasing 4 or more models, you get 5% discount per each item, that’s why there is much to gain from buying the whole collections. Their credits system – is a real godsend! You add a certain sum to your balance, and then buy with 1 click. It in a big way can save your time, especially if you are a 3D studio or you need to download a 3D model quickly. One more thing about support. For the first time I asked a couple of questions via support system and got a response during an hour, it was truly quick response. Though, for the second time I was less lucky, I got an answer only in 5 hours. For these cases there is a FAQ and Help sections, where you can find answers to the vast majority of questions, without contacting support team. 3DExport team also offers a free conversion of purchased 3D models with an extensive list of formats. What I really like about 3DExport as a seller, is its sales royalty. Here you can get from 60 to 85% of each sold 3D model; on TurboSquid they offer 40% for non-exclusive sellers like me, and 50-60% for exclusive ones. I guess for those who aren’t in their exclusive program, it is a great opportunity to join 3DExport in order to increase income. What I really adore about 3DExport is their system of submitting items. I have never met on other 3D stocks such a convenient uploader like this one on 3DExport. As a usual submitting an item can be really tiresome, but not here. If you prepare images and information about your unit beforehand – the process will take seconds. I can specially highlight an export function of your items from TurboSquid and The3DStudio. You put Item ID from TurboSquid or The3DStudio and all the information about it (except images and archives) and in a minute a submission form is filled (name, description, price etc. 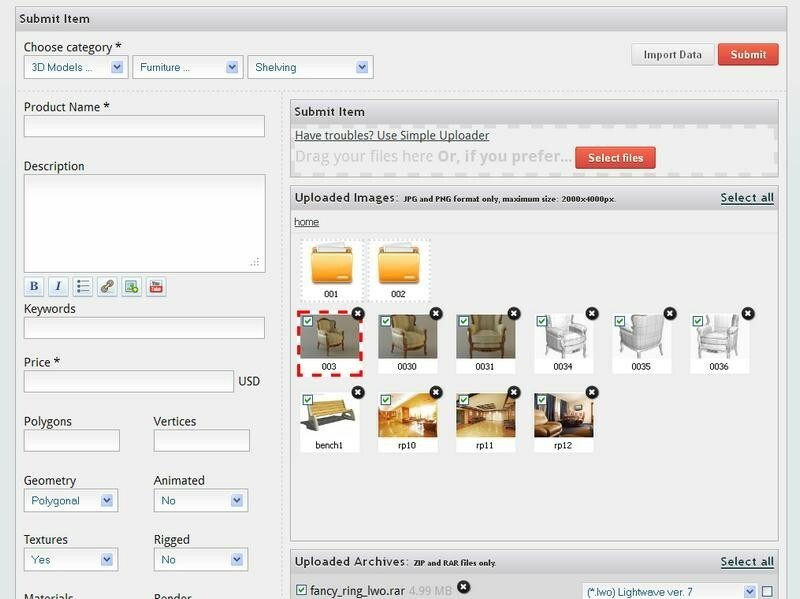 ), while you upload files, that is unbelievably convenient! 3DExport pays through 3 payment systems – PayPal, Moneybookers and Webmoney. I am accustomed to use Paypal system, though it’s good to have a choice, isn’t it? I like 3DExport – the store is very loyal to the users, it has a convenient and intuitive interface. Although the sales are not as high as of TurboSquid and The3DStudio’s ones, but it’s highly possible that 3DExport will challenge them in future and even now many options make it very attractive for both sellers and buyers. Thank you for such interesting article. I will try you service.